Pictures posted on social media showed enormous plumes of smoke billowing into the city&apos;s skyline and flames engulfing large sections of the historic building as the blaze spread rapidly. Yeah that is awful, but it is way worse than that now. The fire is raging right now. That building is toast. That will take decades to replicate. Can’t be replicated. One of kind. Unbelievable. So sad. Such a beautiful place. I hate it. And very sybolic of what's happening to France. 800 yrs old & even Napoleon used it during his time. 13,000,000 vistors a year will now have No beautuful cathedral to see & visit! ?? Re: 800 yrs old & even Napoleon used it during his time. There is still St. Peter’s. I’ve been to both St. Peter’s and Notre Dame. In my opinion, once you’ve seen St. Peter’s there no need to go see any other cathedrals. It is the by far the greatest and most beautiful cathedral in the world. And OMG all the art work there. Simply breathtaking. the good news, if it can be called that, is that a good bit of it was actually damaged beyond use during the French Terror, and so much of what is there is actually about 150 years old, rather than 800. But there are plenty of parts that really are 800 years old. The other good news is that apparently they were able to contain the fire so that the whole structure didn't collapse. 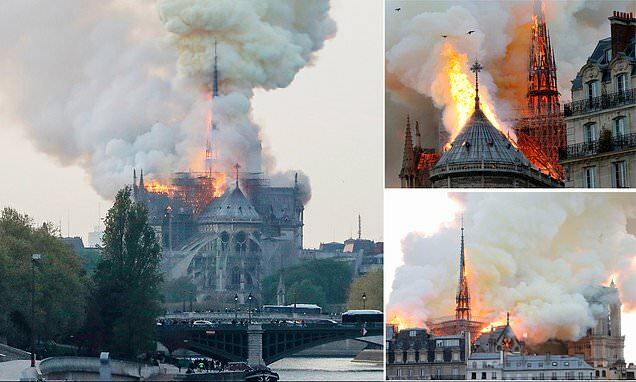 How does fire get that far in a historic building in as large a city as Paris in 2019. I toured it in 1976. Very sad. Can't get water where it's needed. The tallest articulated aerial devices aren't tall enough to reach over the walls and put enough water down into the seat of the fire. It's also a crazy high fire load, over 50 acres of wood inside. This fire will burn until it runs out of fuel. Unbelievable. Heard a commentator say a French news service indicated it started in the attic. Almost all the American news outlets are misspelling the cathedral. From what I've read on Twitter (so take it for what it's worth) the fire started on accident by ongoing repairs being made. Hopefully, they were able to save the relics and artwork that had not been removed for the restoration. "Paris’ Notre Dame Cathedral has been saved from “total destruction,” according to a French fire official, after a massive fire ripped through the structure on Monday and caused the roof and main spire to collapse. While it will take another three or four more hours to contain the fire, the official said the two towers have now been saved. That news come as a sign of relief after one of the towers caught fire earlier in the evening. Earlier, a French Interior Ministry official had said that firefighters might not be able to save the cathedral." A terrible loss! Still more tragic though has been the loss of faith in France and all of Europe. I pray as this magnificent cathedral is restored, so will the faith of Europe. countries abandoned religion in large part was because the church became intertwined with the state and found more and more that it was less interested in serving Christ and more interested in serving mammon. are probably not the ones you'd want to live in, or even visit. least to learn this was an act of religious terrorism. Paris police have hinted the March 17 fire in St. Sulpice, which damaged a door and window and spread soot on pews and artworks inside the church, might have been caused by homeless people setting old clothes ablaze. “This is not an anti-religious attack,” said the Rev. Jean-Loup Lacroix, the pastor of St. Sulpice.